"As long as they roam the Earth, nothing can harm the pure of heart." Throngs of fantasy fans (myself among them) have been eagerly counting the days for this highly-touted, 2-disc release of Ridley Scott's lush 1985 epic, Legend. Scott (Alien, Bladerunner, Hannibal, Gladiator, Black Hawk Down) is certainly an accomplished filmmaker, and one who knows his way around dark and fantastic storylines. But his sole foray into the world of sword and sorcery came to be remembered more for its harshly edited U.S. release, and its out-of-place synth score (from Tangerine Dream) than anything else. While it is true that the visual scope of Legend is magnificent, and that it delivers one of filmdom's most striking villains, the problem that the faithful fanbase has encounter over time is that word leaked out that what we had been seeing in theaters in the States—where it flopped—was not the only version, and that a far different experience, closer to what director Scott had originally imagined, existed. In 1985, filmgoers in Europe were treated to an expanded version of Scott's vision, running nearly thirty more minutes and, most of all, it included a Jerry Goldsmith orchestral score in place of the bubbly electronics. Of course, this was pre-Internet, so much of the buzz came in slow trickles, popping up here and there in grubby film magazines, especially after it was eventually released on VHS (see, it was a looong time ago). We all know that memories have a way of sometimes tweaking the past, making things seem better than they really were. So the question is, now that Universal has dished out this beautifully-packaged "ultimate edition" that features the infamous European director's cut (as well as the original U.S. version), does Legend hold up? Was the hubbub about the longer version really true? 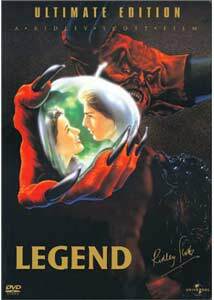 I hadn't seen Legend in quite a few years (my VHS copy long since gone), so I was as curious as anyone. Much of the criticism of the film was that it was all eye candy, with no real narrative substance; that's not a completely incorrect statement. Scott had created a remarkable visual experience, but for many that was what made the film so memorable. The good news is that when you can compare the two releases, it seems as if the expanded version is an entirely new film (a much better one at that) due, I believe, in no small part to the inclusion of Goldsmith's score. But it's not just the score that is thematically different; I urge you to compare the drastically different opening sequences, and how the U.S. release featured a lengthy text scroll and full shots of the villain Darkness, while the director's cut opts for a more subtle approach, ditching the text scroll, featuring only the clawed hand of Darkness. This version of the opening alone changes the whole tone of the film, and signifies the inherent difference between the two releases. As with all good fantasy, the film is set in an indeterminable time period, when magic, faeries and sprites filled the forests, and all-consuming evil could be behind the next tree. The plot itself is remarkably spartan, and concerns the lovely Princess Lily (Mia Sara) and her flowery prose-filled relationship with the mysterious forest dweller Jack (a post-Risky Business Tom Cruise). Unknown to them, the vile lord Darkness (Tim Curry buried beneath a mountain of latex) has demanded the execution of a sacred unicorn, which brings about complete and permanent ice-covered darkness across the land so that he can rule. True to the genre, Legend becomes a quest and redemption film, as both Jack and Lily embark on separate adventures to ultimately undo what has been done, each blaming themselves for what has occurred. Jack is aided by an odd quartet, including the elvish Gump (David Bennent), dwarves Brown Tom (Cork Hubbert) and Screwball (Billy Barty), and the Tinkerbell-esque Oona (Annabelle Lanyon). Lily has to go it alone, and her involvement largely mirrors Cocteau's Beauty and the Beast, as she finds herself deep within the lair of Darkness, enveloped in a strange mixture of sexual tension and danger. It's not the somewhat traditional fantasy plot that makes this such an enjoyable film. It is the vision that Scott has managed to bring to the screen that makes it really something to experience. Peter Jackson's The Lord of the Rings has set the new standard for serious and grim fantasy, but Legend cannot be far behind. It is a soft-focus world of deep, dark forests, where the air is constantly filled with rose petals and cottonwood seeds, and every locale looks like a Maxfield Parrish painting on acid. I can't remember when I've seen rendered as beautiful a depiction of a fantasy environment, especially one created in the pre-CG universe of 1985; the elaborate forest set is still as visually stunning today as it was then. A good fantasy is populated with eccentric and strange creatures, and this is one of the only areas of the film where it reads slightly dated. Made before CG effects, Rob Bottin's makeup effects for Tim Curry's devil incarnate, Darkness, are incredible (with his massive curved horns and cloven hooves), and the evil goblin Blix and dwarves Brown Tom and Screwball look like heavily costumed actors under latex appliances. Even the elven ears of Gump sometimes appeared glaringly artificial. If a film like this were to be made today, these characters would likely be computer-generated, but Scott was forced to rely strictly on in-camera shots, and the result is still, for the most part, a success. The director's cut is the preferred viewing choice here, and the roughly thirty extra minutes allow Scott to give his already leisurely-paced tale more time to meander along its way. This 2-disc set is also a great example of how a proper score can breath new life into a film, and more importantly, how the wrong score and studio-forced editing can be a tragic mistake. Image Transfer Review: Universal has issued Legend with sharp, pristine 2.35:1 anamorphic widescreen transfers for each version of the film. This was not intended to be a bright tapestry, but rather a soft palette of muted colors, and that effect is captured perfectly. The forest scenes are where this transfer excels, and they still stand as some of the most visually lush sequences in the film. Some of the interiors in Darkness' lair have inconsistent black levels, resulting in some muddy shadowing. A bit of grain, and some minor compression issues are evident, but not excessive. Audio Transfer Review: The director's cut features DTS, 5.1, and 2.0 surround, while the U.S. release gets a solitary 2.0 mix; that alone should tell you which version is the anchor of this 2-disc set. Even with the DTS and 5.1 tracks, the surround mix is never too aggressive, so if you're looking for a solid reference disc, this ain't it. Dialogue is mixed well though, and anchored solidly in the center, ringed by sound effects and Goldsmith's generally superb score. The 2.0 track on the U.S. release sounds downright tinny when compared to the fullness of the DTS and 5.1 options on the director's cut. Over analysis of an audio mix is often a heated source of debate among DVD buffs, but this is an impressive sounding disc (disc one, that is), considering the age of the film. Extras Review: This 2-disc set is packaged in a clear tri-fold Amaray case that smudges kind of easily, and doesn't have a slot for the included foldout booklet. The extras are plentiful, though it's the commentary and the brand new, fifty-minute feature that make this DVD worthwhile. In addition to the director's cut of Legend, the only extra on the first disc is another honest and revealing full-length scene-specific Ridley Scott commentary. A well-spoken Scott waxes nostalgic on the project, and though the first twenty minutes or so replicate much of the info found on disc two's documentary, it is still loaded with not only detailed production and casting insights (the benefits on CG vs. non-CG), but with a level of deeper discussion on some of the influences and origins for the screenplay. There is much discussion on the creation of the elaborate forest set, as well as the large-scale fire that occurred shortly before filming ended. Some of the factoids are cool movie nerd fodder, such as that Jack's shiny chain mail was made out of beaten beer bottle tops or that the actor who played Gump (David Bennent) spoke with such a heavy German accent that it was feared he would sound too much like a Nazi (he was later overdubbed by Alice Playten, who portrayed Blix). It's clear by listening to this track that Scott put a lot into this film, and that its subsequent theatrical failure was more than a bit startling to him. Up until now, this was the only version available, including the infamous Tangerine Dream score, which now seems horribly dated. This is the version that's been in my memory banks since 1985, but now the juxtaposition of the synth score with the fantasy elements looks like a poorly conceived experiment. With a ninety-minute runtime designed for short attention spans, the U.S. release still retains the powerful visuals, despite a clunky opening sequence, but when compared to the more expansive director's cut, now seems choppy and uneven. While it is also presented in 2.35:1, it is only packaged with a 2.0 surround mix, and it's clear that it is the redheaded stepchild of the two versions, relegated to an already crowded supplemental disc. The image transfer is clean, but somehow a bit less vibrant than the director's cut. This feature, created specifically for this DVD release, gathers up comments and recollections from just about every principle member of the production crew and cast (except for Tom Cruise, of course). The comments and anecdotes cover the gamut from story creation through production and makeup design, and the impact of the massive studio fire at the James Bond stage where Legend was filmed. Mia Sara (still adorably radiant, by the way) fesses up to having had a major crush on Ridley Scott, and there is some surprisingly good comedic moments when makeup effects wiz Rob Bottin's admits which rock and roll star was the influence for the character of Blix. On the more serious side, Ridley Scott openly confesses that the Tangerine Dream score "was the wrong thing to do". Excellent stuff, and extremely enjoyable. The loved-or-hated Tangerine Dream score, which includes some alternate cues not used in the final film, is available in an isolated form, though sadly only in 2.0 surround. Not their strongest film score by far (I prefer Miracle Mile), and certainly not completely representative of their overall work. I only wish the Jerry Goldsmith score on the director's cut had been given the same treatment. This much ballyhooed lost footage was discovered in March 2001, and features a different opening sequence than was used in either the U.S. or director's cuts, in which Blix, Pox, and Blunder are joined by a fourth goblin, Tic. The rough (emphasis on "rough") print is non-anamorphic (though it is in 2.35:1), and it is in really bad shape. The scene runs far too long, and is more of a curiosity than anything else. The Faerie Dance (02m:45s)Editor Terry Rawlings preserved the audio portion of a scene featuring a wild dance done by Gump, Brown Tom, Screwball and Oona, when they first encounter Jack after the world has become ice-covered. The original footage has long since been destroyed, but here it is somewhat recreated via storyboards and production stills. There are two theatrical trailers (U.S. and international), and both are presented in grainy full frame. The pair are virtually identical, and completely fail to capture any of the film's beauty. Four television spots reinforce how poorly this film was marketed. No wonder it flopped theatrically. The continuity group is easily the most interesting and unusual of the batch. One of rock's most debonair hipsters croons his way through a weak Avalon-ish song used over the credits of the U.S. release. Oddly enough, the over-produced music video features a lot footage from Legend's climax, which seems to be just another nail in the shoddy marketing coffin from back in 1985. The rest of the extras include some fairly copious production notes, subtitles (English, French, Spanish), bios and a DVD-ROM feature that allows access to script-to-screen comparisons. Ridley Scott's fantasy epic finally comes to DVD as it was meant to be seen, and I can honestly say it was well worth the wait. This is not a razzle-dazzle action film, but instead it is a fairly slow-moving visual treat, and that fact may be a bit unsettling for some of today's quick-edit weaned viewers. Universal has kindly offered both versions of the film here, as well as an insightful director's commentary and a fine mix of other extras, including a new fifty-minute "making of" piece.